Farmer's Daughter Quilter: Where's the Pot of Gold? 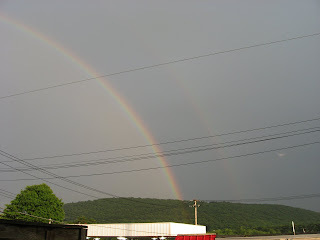 Tuesday night we had a double rainbow. I wanted Bob to walk down to the golf course and bring bring the pot of gold. He said the leprechan would grab him and refused to go. Yes, that's Fluffy at the table. The Campfire Girls were at Jeanie's house in Lisle. 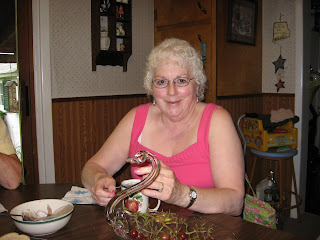 That is a glass swan she found in her top cupboard. Jeanie's getting a new kitchen and is cleaning out all her cupboards. Her family is installing the new cupboards and doing the work for her. It will be so nice when it is finished. We sat there and watched the birds and a squirrel feeding. The Campfire Girls are coming here today. We were going to Cutler Gardens for the Rose Walk but it is raining right now. "Rain by 7, clear by 11" is what Dad used to say. Maybe we'll just play cards or dominos and have lunch. We can change plans. Just getting together is fun.